A monument to Vladimir Lenin, the legendary leader of the Great October Revolution, has been exploded in St. Petersburg. 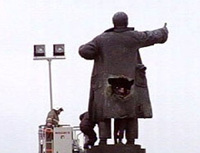 The monument to Lenin on the square in front of the Finnish Railway Station in St. Petersburg was seriously damaged as a result of explosion. The incident occurred on April 1 at about 4 a.m. A large hole can be seen on the back of the leader of international proletariat. The hole is about 80 centimeters in diameter. Eight of ten illumination lamps were damaged too. The power of the bomb was equal to 300 grams of TNT, experts said. The police are now trying to identify the man who placed the explosive device on the backside of the monument. The monument to Vladimir Lenin near St. Petersburg’s Finnish Railway Station was already vandalized at the end of November. Someone mounted a large knife in the hand of the monument for no particular reason. The monument was erected in 1926 in honor of Lenin’s return to the city after emigration on April 3, 1917. The monument was not damaged in the Leningrad Blockade during WWII. People made a wooden box for the monument, filled the box with sand and covered the pedestal with soil.